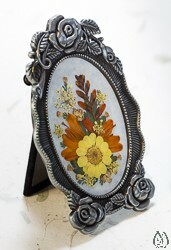 This handmade, 100% real flower curio picture features orange montbretia, yellow desert marigold and queen-ann's-lace. Makes an everlasting keepsake or special gift. One-of-a-kind, what you see is what you get. Flowers have been laminated for protection and oval area is 3" by 2". The metal pewter tone frame is 4 1/2" high by 3" wide with easel back. Includes separate information slip about what flowers are included and what makes this so special. ~ Further details: We can send the picture directly to your recipient with no pricing on the invoice by letting us know the shipping address is for the recipient when checking out. You can include your message or greeting in the comments section, and we will put it inside the box. Items that do not already include a gift box will be wrapped in decorative paper or gift wrap at no additional charge. Note: Em includes a business card size calendar with every order shipped. Em's Place (this site) sells wet shaving products, botanical specialties and handmade items by Em. Owned and operated by Em's Place, Inc.
Personalize Items using Em's Designs showcases products that can be customized, for example t-shirts, mugs, greeting cards, stickers and more. Affiliate relationship and owned/hosted by Zazzle, Inc..
Em's Fine Art Gallery is Em's photo portfolio with the option to purchase professionally printed images on a variety of substraits. Affiliate relationship and owned/hosted by Fine Art America. Note: Purchases from each site listed are separate and independant from each other. Check each respective site for terms and information.